In a frankly laudable display of self-awareness, one of the men who occupied a nature preserve in Oregon earlier this year has filed court documents declaring himself an “idiot” and “incompetent.” Ryan Bundy says he’s not subject to federal law, due to his idiocy. Bundy is one of 26 people awaiting trial on federal conspiracy and firearms charges for occupying Oregon’s Malheur Nature Preserve for 41 days this winter. 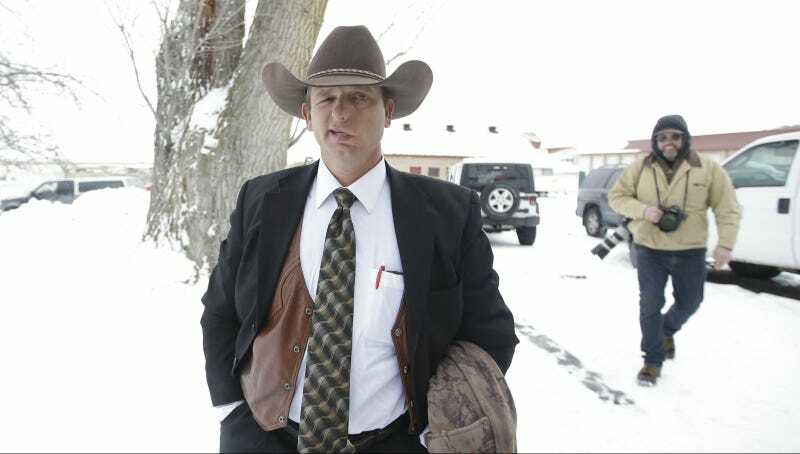 Both Ryan Bundy and his brother Ammon, also awaiting trial, consider themselves to be sovereign citizens, as does their father Cliven, who famously led a standoff against federal agents on public ranchland in 2014. (Ryan, Ammon, and their dad have also been indicted for that, because declaring the government isn’t the boss of you does not always make the government go away). Bundy, who is representing himself in the conspiracy case against the refuge occupiers, declares himself an “idiot of the ‘Legal Society’” and not subject to federal law, according to the documents. “I, ryan c, man, am an idiot of the ‘Legal Society’; and; am an idiot (layman, outsider) of the ‘Bar Association’; and; i am incompetent; and; am not required by any law to be competent,” Bundy wrote in a motion filed to U.S. District Court Judge Anna Brown. Bundy muses in the filing that he is “willing to consider” playing the role of judge or bailiff in the case if the court pays him a similar sum. “I, ryan c, man, will charge $100,000,000.00 if any man or woman or PERSON places another order for [me] to come before the court again regarding this matter,” Bundy wrote. About ten days ago, Bundy was accused of trying to escape the Multnomah County Jail by braiding his bedsheets together into a rope, which was discovered during a search of his cell. Bundy was also stockpiling food, spare boxers, pillowcases and more torn bedsheets under his bed, prosecutors said. Bundy is set to return to court Wednesday for a status hearing in his case. The Malheur occupation has turned out poorly for a whole lot of the people involved: a Kansas woman named Odalis Sharp lost custody of some her 10 children this week after taking seven of them to Oregon to sing for the occupiers. (The Sharps have a family gospel band). One of her daughters was riding with occupier LaVoy Finicum when he was shot and killed by police during a standoff spurred by a traffic stop. Sharp is also accused of beating her children with a rod; three of them testified that she would say she was trying to “beat the fire” out of them. Five of the children escaped her home in April while Sharp was in the shower.